It’s the sound of the hero’s fall in James Joyce’s hallucinatory behemoth Finnegans Wake. And in this case it is the sound of the passing away of Steve Jobs. Visionary icon, co-founder of Apple, saviour returning from corporate banishment, a changer of the way we think and do things…it all reads like a veritable Heroes Journey. 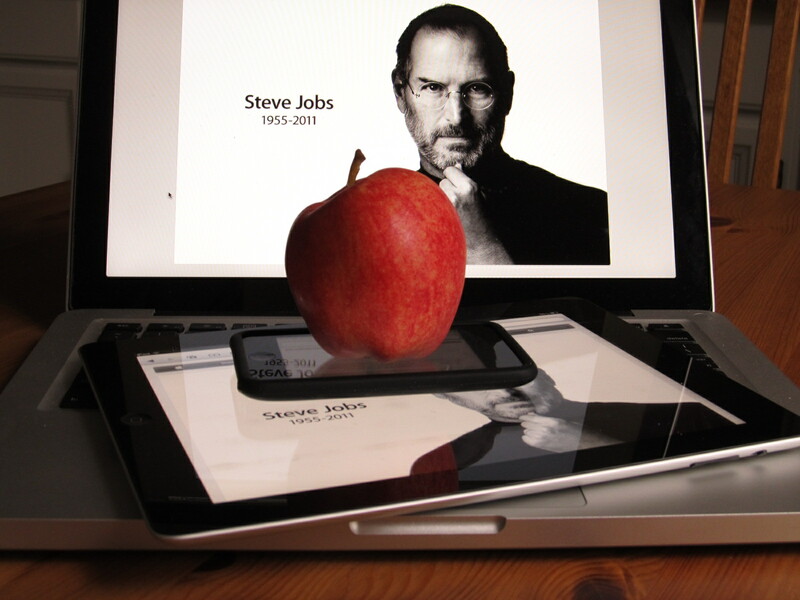 As I wrote yesterday’s post word was spreading that legendary Apple co-founder and former CEO Steve Jobs had died. The post I was writing was on the death of the hero, the fifteen hundred year career of Western Europe’s warrior knights and kings having passed definitively, as interpreted by such artistic giants as James Joyce, Thomas Mann, Marcel Proust, Pablo Picasso, et all. I wrote the post on an iPad 2, which then automatically transferred the writing to my home based MacBook Pro the minute I entered the house. There, I edited it, wirelessly scanned in a few images and with the invaluable help of WordPress posted it to the net. Just as it has for hundreds of millions of people, Steve Jobs’ visionary magic has touched my life. At the very least, this blog wouldn’t exist without it. Never being a techy the simplest computer things often remained beyond my grasp until I made the switch to Apple. Sure, there is a premium, but the machines and gadgets work, plain and simple. And now, the spirit of life manifested as Steve Jobs has passed beyond this mortal coil. As we all will one day. However, some souls touch our lives–with their vision, with their courage, self-sacrifice, unflinching devotion to a cause, with their grace and humility of spirit. They are the heroes. They stand at the vanguard and face the challenges for us, they inspire and by their example draw out the very best in ourselves. They are the best in ourselves, and without them we would be lessened, less glorious. Hence the spontaneous outpouring of sympathy and sorrow flowering across every land in the wake of the news. We have an instinctive affinity–a need and yearning–for heroes. Indeed, we are hardwired for them, and we experience their passing at the most profound level. But never despair. Life is eternal and every passing is balanced by a birth. More heroes are being born as I write this line, more are tiny toddlers learning the difficult tasks of talking and walking, more are in their teens peering out upon the world in search of a challenge commensurate with their burgeoning spirit. New shoots push their way up through soil rich in the nutrients of the dead. And that leads me by a commodious vicus of recirculation (that’s from the last and first line of Finnegans Wake) back to James Joyce. Last and first because the book is a vast cycle, without beginning or end. Or every end being a beginning. It is the story the hero–who is every one of us–through all space and all time. It is why Joseph Campbell title a book The Hero With A Thousand Faces. Finnegans Wake. Finnegan’s Wake. In the wake of finishing again. All you Finnegans, WAKE UP! To the memory of Steve Jobs, 1955-2011 .